Surface Tension and Capillary Action? What is the difference between adhesion and cohesion? Surface tension is a property of liquids that arises from unbalanced molecular cohesive forces at or near a surface. 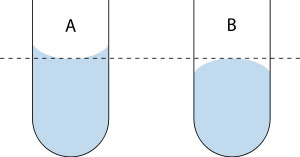 At an air water interface the surface tension results from the greater attraction of water molecules to each other (due to cohesion) than to the molecules in the air (due to adhesion). The net effect is an inward force at its surface that causes water to behave as if its surface were covered with a stretched elastic membrane. Because of the relatively high attraction of water molecules for each other, water has a high surface tension. Surface tension arises from the strong interactions between water molecules, called hydrogen bonding. It is this strong interaction which also manifests in the other unusual property of water such as its high boiling point. Surface tension of water also manifests as the so-called hydrophobic effect. Hydrophobic molecules tend to be non-polar and, thus, prefer other neutral molecules and non-polar solvents--"water- hating". A hydrophilic molecule or portion of a molecule is one that has a tendency to interact with or be dissolved by water and other polar substances --"water-loving" -- See also: How does soap work? The cohesive forces between molecules in a liquid are shared with all neighboring molecules. Those on the surface have no neighboring molecules above and, thus, exhibit stronger attractive forces upon their nearest neighbors on and below the surface. For molecules in center of water, all attractive forces are balanced. and inside liquid is under pressure. The meniscus is the curve in the upper surface of a liquid close to the surface of the container or another object. It is caused by surface tension. It can be either convex or concave, depending on the liquid and the surface. A shown on Left -- a concave meniscus occurs when the particles of the liquid are more strongly attracted to the container than to each other, causing the liquid to climb the walls of the container. This occurs between water and glass. B shown on Right -- a convex meniscus occurs when the particles in the liquid have a stronger attraction to each other than to the material of the container. Convex menisci occur, for example, between mercury and glass in barometers. Note: Cohesive attraction or cohesive force is the action or property of similar molecules sticking together, being mutually attractive. Cohesion, along with adhesion (attraction between unlike molecules), helps explain phenomena such as meniscus, surface tension and capillary action. image edited from Reading the Meniscus (Jleedev) Wikipedia. --soap being used the break up water tension. Surface tension has the dimension of force per unit length, or of energy per unit area. The two are equivalent—but when referring to energy per unit of area, people use the term surface energy—which is a more general term in the sense that it applies also to solids and not just liquids. Surface tension, usually represented by the symbol γ, is measured in force per unit length. Its SI unit is newton per meter. In terms of energy: surface tension --gamma-- of a liquid is the ratio of the change in the energy of the liquid to the change in the surface area of the liquid (that led to the change in energy). This work W can be interpreted as being stored as potential energy. Thus, surface tension can be also measured in the SI system as joules per square meter. Since mechanical systems try to find a state of minimum potential energy, a free droplet of liquid water will try to assume a spherical shape, which has the minimum surface area for a given volume. Capillary action occurs because water molecules bond each other strongly due to forces of cohesion and adhesion where water molecules are attracted and stick to other substances such as glass or paper. Adhesion of water to the surface of a material will cause an upward force on the liquid. The surface tension acts to hold the surface intact. 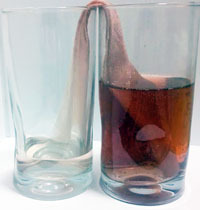 Capillary action occurs when the adhesion to the surface material is stronger than the cohesive forces between the water molecules. 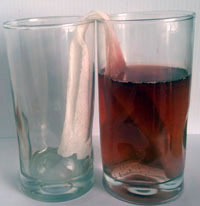 The height to which capillary action will take water is limited by surface tension and gravity. Notice in the photos above the effect that gravity has on capillary action. Water being a polar molecule and low mass moves easily up the paper. The diluted grape juice contains several non-polar red pigments which are not very soluble in water and do not migrate with the solvent. If one takes a small capillary tube an inserts it in water and the tube does not have a vacuum like a barometer but is open at top, water will start to rise up. Water wants to stick to the glass and surface tension will push the water up, until the force of gravity prevents further rise. Capillarity is the result of cohesion of water molecules and adhesion of those molecules to a solid material. In the case of a glass tube inserted in water with openings at both ends, as the edges of the tube are brought closer together, such as in a very narrow tube, the liquid will be drawn upward in the tube. The more narrow the tube, the greater the rise of the liquid. Greater surface tension and increased ratio of adhesion to cohesion also result in greater rise. Since for water in a tube all values are constant except r, radius, the height of rise is solely dependent on the radius of the tube. 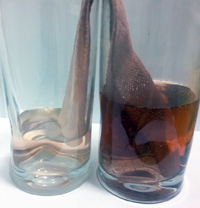 Capillary action is due to the pressure of cohesion and adhesion which cause the liquid to work against gravity. Capillary action (sometimes capillarity, capillary motion, or wicking) is the ability of a liquid to flow in narrow spaces without the assistance of, and in opposition to, external forces like gravity. 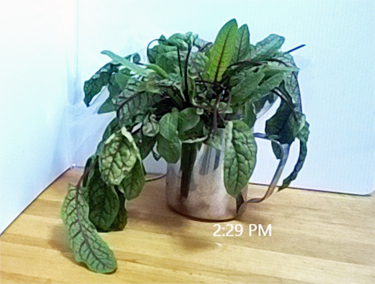 The plant on the left was not watered for 2 days and allowed to wilt. Capillary action is what draws the water from soil back up to the leaves. Capillary action is the process that plants use to pull water and mineral up from the ground. It is is the movement of liquid along a surface of a solid caused by the attraction of molecules of the liquid to the molecules of the solid. The molecules of the water (liquid) are attracted to the molecules inside the stem similar to capillary action of water in a glass tube. There are three forces involved with the process of capillary action in plants. 1) Adhesion, the process of attracting two dissimilar molecules. For plants, adhesion allows for the water to stick to the organic tissues of plants. 2)Cohesion keeps similar molecules together. For plants, cohesion keeps the water molecules together. 3)Surface tension is a property of liquids that arises from unbalanced molecular cohesive forces at or near a surface..
a) Cohesion keeps similar molecules together while adhesion is a repulsive force between similar molecules. b) Adhesion is an attractive force while cohesion is a repulsive force. c) Adhesion is an attract force that occurs between similar molecules while cohesion occurs between different types of molecules. d) Cohesion is an attractive force between similar molecules while adhesion is between dissimilar molecules. 3. What contributes to the formation of a meniscus in a graduated cylinder? c) a meniscus forms in a graduated cylinder due to the response of the material of the graduated cylinder (usually glass) to the liquid contained within. b) capillary action draws water and minerals up from the soil to the stems and leaves in plants. d) capillary action allows plants to overcome the cohesive forces with the plant. 5. Why is the meniscus of mercury convex? b ) A convex meniscus occurs when the particles of the liquid are more strongly attracted to the container than to each other, causing the liquid to climb the walls of the container. c) A convex meniscus occurs when the particles in the liquid have a stronger attraction to each other than to the material of the container.